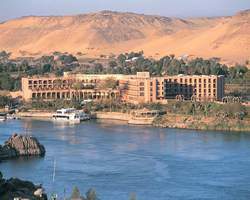 Exotic LTI- Pyramisa Isis Island Aswan Resort in the middle of the Nile on an island near the center of Aswan. 28 acres of landscaped gardens with magnificent views of the Nile , mountains and Aswan city. Pyramisa Resort is a few minutes sailing to Agha Khan Mausoleum and downtown shopping area . Spacious standard rooms ( 35 sqm ) . All rooms have 2 beds or 1 large bed. Air-condition, full bathroom , color TV , cable channels and mini-fridge. Spacious superior double rooms ( 35 sqm ). All rooms have 2 beds or 1 large bed. Balcony with magnificent View of the Nile , gardens and S. pools view . Superior room with a large terrace ( 35 sqm + 25 sqm terrace ) . Spacious Suite ( 55 sqm ) . Closed master bedroom with private bathroom , 1 large bed. Separate living room with a dining area . Air-condition, full bathroom , toilet, color TV , cable channels and mini-fridge. Spacious Suite ( 250 sqm ) . Closed master bedroom with private bathroom , dressing room , 1 large bed. Separate living room , salon, with a sofa bed and a dining area . In addition to the buffets with international and local cuisine offered daily at Ramsis restaurant , enjoy a warm candle light dinner at our elegant Nefertari a la carte restaurant , or a casual meal at Pyramisa Isis Island Resort & Spa Italian restaurant . After dinner , enjoy your favorite drinks at our piano bar with live entertainment : experience an authentic Nubian night with live folkloric shows at the Nubian village , or simply dance the night away at our exciting discotheque. Ramsis restaurant : International and traditional cuisine buffet.
. Nefertary : A la Carte restaurant international cuisine. Experience an authentic Nubian night with live folkloric shows at the "Nubian Village", a great place to meet family and friends in an oriental setting. An elegant a la carte restaurant serving the very best of Italian cuisine. where you relax & enjoy the warmest atmosphere , “Sun Set” Terrace is open all day serving drinks, cocktails and refreshments. Breathtaking views of the Nile and the West Bank captivate guests on the SUN RISE Terrace. Enjoy snacks, sandwiches and Drinks. Enjoy Light snacks , pastries, ice cream and refreshments around the clock. Hathour " Ballroom accommodate functions up to 700 persons, ,equipped with most advanced conference equipment , Ideal for meetings, seminars, receptions or private functions. Located at Ground floor in the Conference Center. "Amoun " meeting room : located at Ground floor in the Conference Center , equipped with ultra modern meeting and conference facilities that can accommodate up to 40 persons. Breakout rooms : located at Ground floor in the Conference Center , Ideal for smaller meetings, sessions , seminars & workshop that can accommodate up to 40 persons. is a comlete wellness experience for your body, health and soul too .